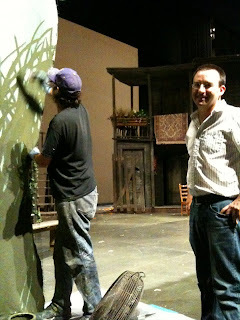 As Seattle Opera's Associate Resident Scenic Designer, Phillip Lienau (left) makes an artistic contribution to our production of Porgy and Bess that goes well beyond designing the benches Props Master Pete Olds mentioned yesterday. Jessica Murphy chats with Phillip about new locations and elements he's designed for this Porgy and Bess production, working with Seattle Opera's great tech team, and his upcoming Seattle Opera debut designing our new production of Orphée et Eurydice for next spring. We are renting this Porgy and Bess production, but you are also designing one new location. Which element of the set have you designed? I designed a new version of the Kittiwah Island scene, the last scene before intermission. The organizing idea was to create shaped surfaces that would accept projections. There are shaped projection surfaces that look like trees. The important thing is to support the emotional aspects of the action rather than to depict a particular place or particular flowers. It should create a feeling, an atmosphere. Can you describe how those shapes will work? The shapes will have two aspects. There are tree trunks and tree limbs loosely based in scale on the old oak trees you’d find in the South. But the other part of the shapes are an abstract field, a solid surface with holes. Shining the light through these holes creates a shadow on the upstage, a layering of light and shadow. It seems as if shadows would be important in that particular scene. One of the challenges we had is that we had to serve two different moods in that scene. The first half is positive and bright and fun at the picnic. People are excited, people are happy. But it becomes a dark, frightening, and intense scene, and we needed to convey both of these feelings. So we tried to paint it in colors that can pick up a bright light and a dark light. I also designed another item on stage left, a new wall with a door and a window in Serena’s room. Chris Alexander realized he wanted the door and window, so I was called in to look at the existing set to do what he needed. We studied the existing wall, so we could match the pins and hinges exactly, as if it came with the set. How have you been working with the lighting designer, Duane Schuler? Once Chris Reay, the projections designer, and I worked out the shapes and the pieces of foliage, that was half the process. We knew what we picked would be affected by Duane’s lighting once he came in. We needed to make modifications to pick the light for these scenes, change the projections, and change the painting. It took having all three of these elements onstage to realize we needed a last-minute change to the set. It also took Chris Alexander on the set to find out where he wanted the people to be in that scene. From there we could see how the light was going to work. When you see the set, you’ll notice that some of these fixed projections surfaces are one kind of green--mid-range green--and we realized that we wanted the bottom part from the ground up to 5-6 feet to be darker because the lights on the singers were making the sets too light, which would distract from the singers. 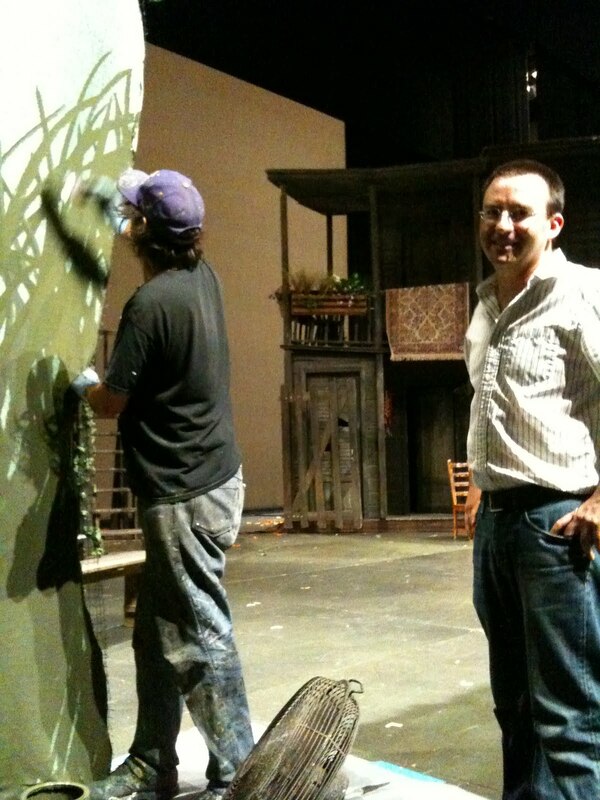 We called in the painters from the Scenic Studios and they added tall dark grass shapes. It was a fast paint because we had a limited time. What we do is background to make sure the singers look great. We don’t want to upstage the singers. Do you also design props? The set designer generally will also design the props. Because it’s a rental set, I was brought in to design additional props: furniture, a sign outside someone’s door, a banner in a Kittiwah Island parade, flags, crates, all the benches in the show. Some of the props already existed, and we’ve repainted them to work with Chris’s interpretation. Your job title here at Seattle Opera is Associate Resident Scenic Designer. What does this involve? 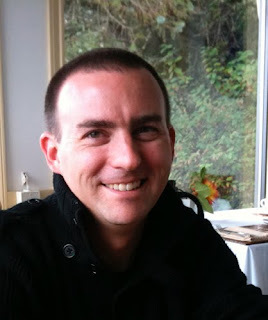 I am the technical draftsman at the Scenic Studios in Renton. I’m the go-to person to assist with scenic design for the company. I was the assistant set designer for Tristan and The Magic Flute. I’ll also be the set designer for Orphée. And then I work with Robert Schaub, Technical and Facilities Director, to make modifications to rental sets. Will you be involving projections in your Orphée designs? I can say right now that there are very few projections as far as we know. The design is still in development. There can be a manmade quality to projections because they are a product of the 20th century, that way of using light and image. But what the director and costume designer are working on is more timeless, with a very tactile, gritty quality to it. What do you like about Porgy and Bess? It’s my first time seeing it, so the newness of it is fun, and I happen to love Gershwin and the story. As a designer I can engage with the wide range of characters and emotions. When you look at the props, there isn’t one mood you want to create. Some are old and poor but some are bright and fun and some are fiery and passionate. Chris Alexander’s interpretation has inspired me to create the scene with many different moods and layers. It’s not about one person but a community. Everyone in the opera has a desire to love and be loved and to make a better life for themselves. I hope you can see that in the world around them. Hallo, Ms. Murphy & Mr. Lienau! Very interesting and VERY informative; I'm glad I was able to read this before experiencing "P&B" at the Premiere on Saturday!! Yes, I really liked your South Carolinan island as I saw it on opening night; I really felt I was there on it with the singers; very atmospheric!!! So, I hope to see many other Buehnenbilder you will, hopefully, design for Seattle Opera and elsewhere!! !